The newest member of the 3,000 hit club and the all-time home run king both know that age—and statistics—are nothing more than numbers, and both are helping the Marlins toward an unlikely pennant race. In other words, one legend coaches the other by letting him be himself. 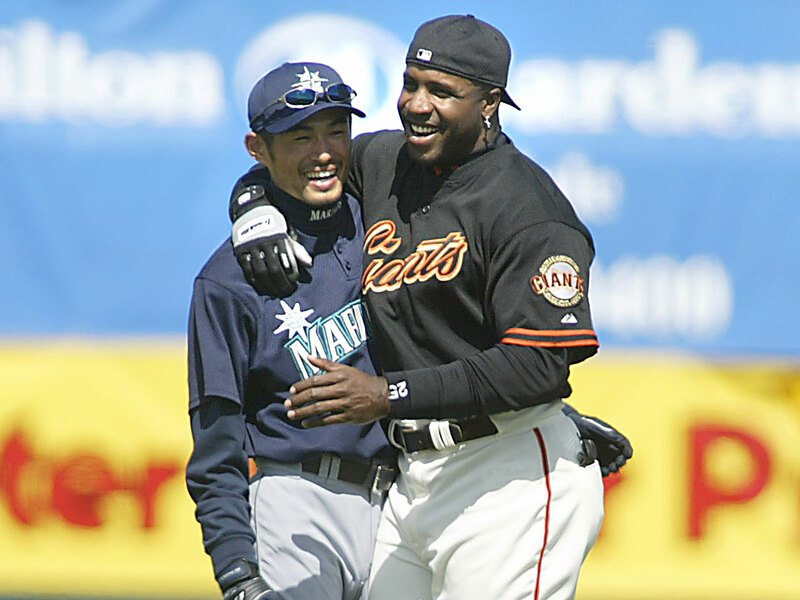 While Bonds became baseball's single-season and career home run king during his 22-year major league career, Ichiro has etched his name in baseball's record book primarily with a wave of hard-struck singles. In 2004, he set a new single-season hits record with 262, a record 225 of which were singles, including the record-breaker. On Sunday, he became the 30th member of the 3,000 hit club with a triple in Denver, ending a long slog to the milestone in which he had gone just 5 for 31 entering the day since a three-hit afternoon on July 17. Milestones mean little to Ichiro, however. Playing means a lot. Though he is now the game’s oldest position player, he is not close to retiring. It’s a rare moment of insight into his psyche. Ichiro is among the most famous of baseball stars, but also, perhaps, its most unknowable, even 16 years after he arrived from Japan. Some of that stems from a language barrier. Though teammates say he can both understand and speak English—and is a master of idiomatic expletives—he still uses an interpreter, Allen Turner. It is in part a way to ensure that he is perfectly understood, but it also affords him privacy. His role in the world is to play baseball, and it is through baseball that he communicates. As you watch him begin his intricately choreographed routine, it is tempting to view him as a surgeon, dispassionately and compulsively readying his body and his instruments for another day’s procedures. He enters the clubhouse at precisely 4 p.m., wearing a crisp white short-sleeved shirt, a skinny black tie and dark jeans with six-inch cuffs rolled up to his knees, out of which he quickly changes. He lint rolls his arm bands. He foam rolls the knots out of his back. He applies eye drops, and moisturizes his hands and wrists using a cream from a tiny bottle. He removes his bats from their custom-made hard case and holds each up to the clubhouse’s fluorescent light for a full minute, examining them for imperfections that only he can see, wiping off barely perceptible smudges with his gloved thumb. He pulls down his black Marlins hat from the shelf above his locker and examines it, too, cutting off any loose threads. Then he does something unexpected. He brings the cap’s crown to his face, buries his nose in it, and deeply inhales. It is then that you realize that Ichiro is not doing any of this by rote, because he is someone who has played baseball 360 days a year since he was nine and it is all that he knows. He is doing it out of love, a love that is renewed each day. Bonds says that he could, in theory, still add to his total of 762 homers. “I can swing a baseball bat and hit a ball over the fence even now,” he says. The ability to hit a ball never leaves the great ones—not him, and it won’t leave Ichiro, either. “I can still hit, and he’s never going to stop hitting,” says Bonds. “He’ll always be able to hit.” It’s the capacity to do so day in and day out that eventually disappears. Loria, the Marlins’ owner, made his fortune as an art dealer, and until not long ago it appeared as if he might be more interested in assembling a gallery of baseball masterpieces than building a winner: Ichiro and manager Don Mattingly have each won an MVP award, and Bonds won seven during his impressive careers. But Miami, coming off six straight losing seasons, entered Sunday at 58–52 and tied for the second National League wild-card spot, and it is in part because that trio has provided the club with credible leadership that it has long lacked. Ichiro’s on-field renaissance has helped, as he currently boasts his highest batting average since 2009. “He’s been balling out this year, which is fun to watch,” says his 24-year-old teammate, Christian Yelich. “It’s nice to see that he’s still playing well and not just limping to the finish line to get to 3,000.” But the fact is that there is no room for him in the starting lineup most days, not with a trio of burgeoning young stars—Yelich, 25-year-old Marcell Ozuna and 26-year-old Giancarlo Stanton—who have made the Marlins’ outfield one of the league's most potent. 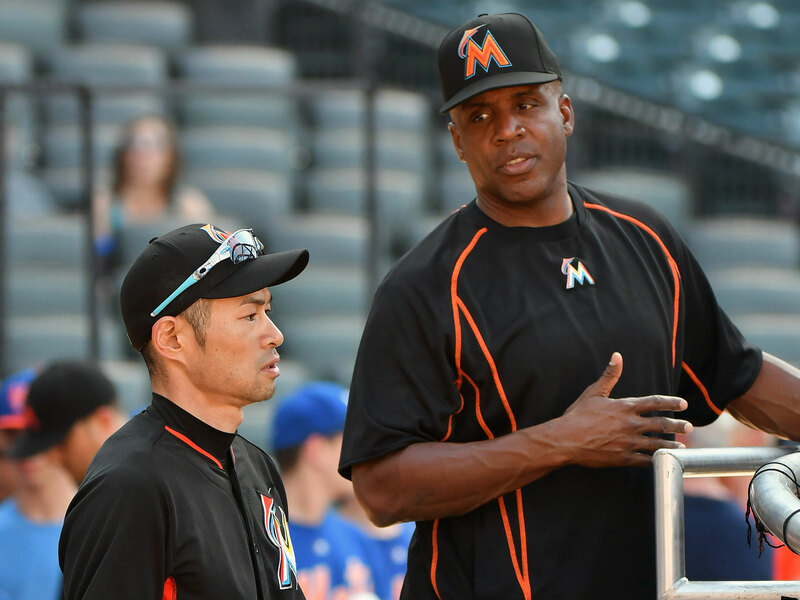 Still, says Mattingly, Ichiro's presence is crucial. The principle, though, is simple: Discover what works for you, even if it doesn’t make sense to others, and stick with it. That is what Bonds has instilled in his team’s young hitters, too—particularly Yelich, who is batting .322 with 10 homers, 54 RBIs and an .892 OPS that is nearly 100 points higher than last year's mark, and Ozuna, who struggled so badly last season that he was demoted to the minors but who this year made the NL All-Star team. Neither has felt any trepidation about approaching Bonds for help, despite his stature. In 1995, when he was 22 and still six years from leaving Japan for the Mariners, Ichiro came to the United States on a tour sponsored by Upper Deck. He met Michael Jordan in Chicago and then traveled to Cincinnati to have dinner with Ken Griffey Sr. and Ken Griffey Jr. There was only one place to which the Griffeys would bring a visiting dignitary to eat, particularly one from Japan: their favorite restaurant, Benihana. So he pushes forward, maintaining his gymnast’s body, examining his equipment, inhaling the wooly odor of his hats. One day, as it was for his hitting coach, it will all be over. Then, perhaps, he’ll enjoy the sum of his accomplishments, his thousands of hits. But when you truly love something, you never want it to end. Ichiro is doing everything within his considerable powers to ensure he has as many baseball tomorrows as he can, and that his 3,000 hits represent only a marker on his life’s road, and not a destination.